When you have made your payment by PayPal or by direct bank transfer, please also email with your request (book name and number of copies) and your postal address. 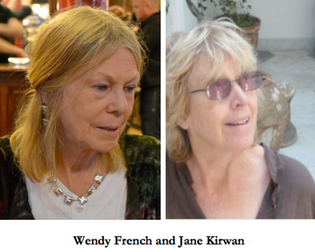 Wendy French has published two chapbooks with Tall Lighthouse, sky over bedlam (2002) and we have a little sister and she hath no breasts (2003), and two collections of poetry, Splintering the Dark (Rockingham Press, 2005) and surely you know this (Tall Lighthouse, 2009 – the title was taken from a Sappho fragment). She has won prizes in international competitions, including first prize in the NHS category of the Hippocrates Prize in 2010 and second prize in 2011. Wendy was head of the Maudsley and Bethlem Hospital School for fifteen years and now works with people with aphasia/dysphasia, helping them to recover their use of language through poetry. She also facilitates writing in other healthcare settings. Jane Kirwan’s poems have appeared in magazines and anthologies in Great Britain and the Czech Republic where she lives half of the year. Her poetry collections Stealing the Eiffel Tower (1997) and The Man Who Sold Mirrors� (2003) and Second Exile, poems with prose by Ales Machacek (2010), were published by Rockingham Press and a Czech version Druhy Exil by Novela Bohemica. She won an Arts Council Writers’ Award in 2002, has been commended and won prizes in many competitions including the National and Hippocrates and has appeared on Czech television and read at poetry festivals in the UK and abroad. Norbert Hirschhorn�reflects on a poetry and prose memoir�that gives�an inside view of the National Health Service at a time when it may be about to�change forever.